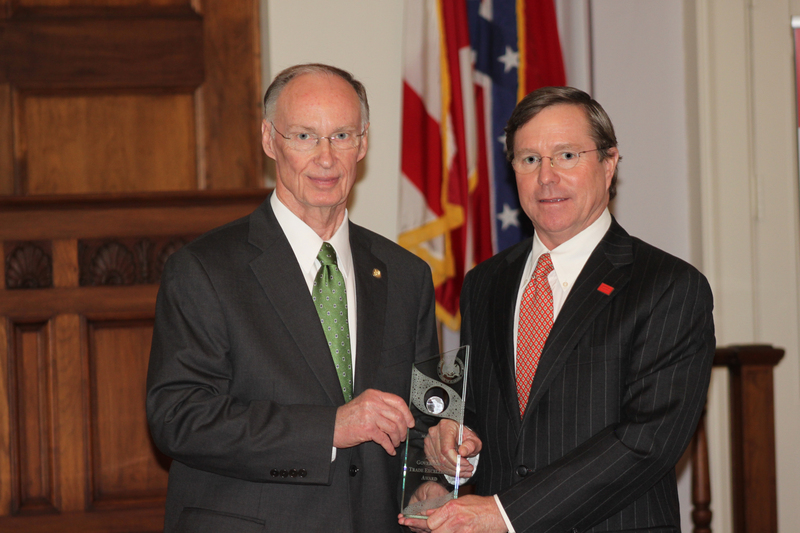 McWane Recognized by Alabama Governor Bentley for Excellence in International Trade | McWane, Inc. Governor Robert Bentley and McWane President, G. Ruffner Page, Jr.
On Wednesday, March 5, 2014, Governor Robert Bentley presented the Governor’s Trade Excellence Awards to eight Alabama companies that are excelling in international trade. The Governor’s Trade Excellence Awards Program was established in 2005 to recognize Alabama manufacturers and service companies for excelling in international trade. The objectives of this program include identifying Alabama’s successful exporters, promoting exporters as role models to the Alabama business community and increasing awareness of the impact of exporting on Alabama’s economy. The awards program is coordinated by the Alabama Department of Commerce and the Export Alabama Alliance. The program recognizes small, medium, and large businesses, including new-to-export companies located throughout the state. Posted on March 7, 2014, in Achievements and tagged Alabama, Governor Robert Bentley, Governor's Trade Excellence Awards, international trade, McWane, Ruffner Page. Bookmark the permalink. Comments Off on McWane Recognized by Alabama Governor Bentley for Excellence in International Trade.